Joy graduated in Fine & Applied art in 2007. Her course was mainly sculpture based, after which she began working with wire to create 3D forms. 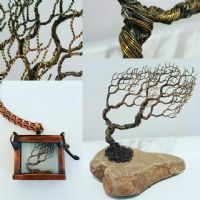 Her signature art form is a tribute to urban birds and trees, which are created by transferring spontaneous freehand scribbles into unique wire sculptures. All of her pieces are different and have their own story to tell.